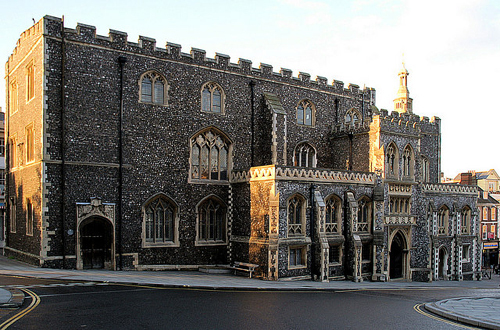 Norwich Guildhall is a Grade I building on Gaol Hill in Norwich, Norfolk. It was constructed between 1407 and 1413 to enable the greater self-governing powers conferred upon Norwich by the Charter of 1404 to be administered more efficiently. Henry IV had introduced a ‘Charter of Incorporation’ to Norwich, granting special privileges to the city and raising its importance to a new level. The charter allowed burgesses to elect a Mayor, collect taxes and hold their own courts of law and with the removal of the popular assembly, was a chance for the government to become more locally representative. Crucially, the charter gave Norwich city status. By 1435 the tower and porch had been added and in 1440 all of the city records were brought over, a reminder of its political responsibility. By 1453 the final windows of the magnificent building were glazed, essentially marking the building’s completion. An upper council (of twenty-four Aldermen, one Mayor and two Sheriffs), with members from ‘dignified’ society and given life-long membership, were to govern alongside the associated lower council, whose sixty members were to act as representatives from the local community. 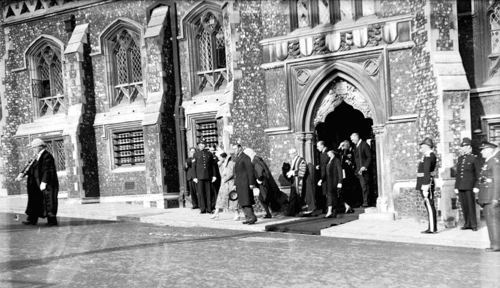 These changes to the political structure instigated a sense of civic pride among the citizens of Norwich; many felt that the growth in the city’s responsibilities and self-governing power should be marked by the establishment of an equally fitting civic building. Prisoners first occupied the crypts of the building in 1412. In 1511 both the tower at the west end and the roof of the Council Chamber, collapsed. The roof was reconstructed between 1534 and 1537 by Augustine Steward, at a cost of over £200. The destruction forced the Council Chamber to move to the east end of the building. As part of the works, the exterior wall of the eastern face of the new Chamber was faced with chequered flint work and freestone, and a central panel containing a fragment of the Arms of Henry VIII, flanked by the City Arms and the arms of the St George’s Company. In 1635 the Guildhall was almost accidentally demolished as saltpetre diggers went down too far. 1723 saw the reconstruction of the porch, and in 1747, after the destruction of the Shire Hall, the Guildhall took on further responsibilities and additional alterations were made. In 1850 the clock tower was erected as a gift from the Mayor, Henry Woodcock. 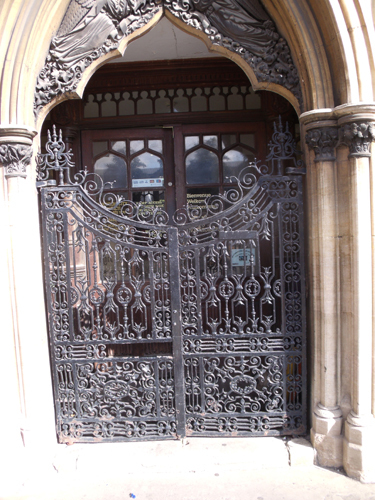 More renovations came in 1857, when the doorway of a house belonging to a Tudor goldsmith was taken down from its original location in London Street and placed in the south-west corner of the Guildhall. Additions to the south side of the building were constructed in 1861 by Thomas Barry, the City Surveyor, and further work was undertaken in 1908. The Norwich Guildhall served as the seat of city government from the early 15th century until 1938, when it was replaced by the newly built City Hall. At the time of the building’s construction and for much of its history Norwich was one of the largest and wealthiest cities in England, and today the Guildhall is the largest surviving medieval civic building in the country outside of London. As well as various courts, a prison and a chapel, the building contained facilities for accounting and tax collection, accommodation for civic officials (it remains the home of the Sheriff’s parlour today) and storage space for records, money and civic regalia. The Assembly Chamber (or Sheriff’s Court) was designed for meetings of the full medieval council. It now contains a virtually intact late Victorian courtroom. The council chamber (or mayor’s court) is more elaborate with oak panelling, a 16-bay roof with tie-beams, renaissance decorative woodwork and stained glass. The undercroft, beneath the east end pre-dates the building, and is thought to be an original feature of the earlier toll-house on this site. It was used to accommodate more dangerous criminals. The Norwich’s Heritage Economic and Regeneration Trust (HEART) has taken on a 25-year lease of the iconic landmark from Norwich City Council. As of January 2015 the building will be another place to explore Norwich’s past. The porch previously had a pair of iron gates to its outer threshold. These are thought to date from the 1720s and were removed several decades ago. They were recently ‘rediscovered’ and the City wishes to reinstate them. I was asked to examine the paint on the gates.